When Jesus was here on Earth, He gave us everything: Knowledge of who God is, Mercy and Forgiveness for our sins, True and Pure Love for all mankind, and Eternal Life through the Blessed Sacrament of His Body and Blood through bread and wine. It was upon the Cross where His Mercy flowed with Water and Blood from His Sacred Heart. Jesus shared His Sacred Heart through the visions of St. Margaret Mary Alacoque, Apostle of the Heart of Jesus. In a vision, Jesus told St. Margaret, “Behold this Heart which has loved men as to spare Itself nothing, even to exhausting and consuming Itself, to testify to them Its love.” Because this devotion was revealed through private revelation, Catholics do not have to believe the messages (CCC 67), but the visions are approved by the Holy See and it’s message and devotion has brought many blessings to those who dedicate themselves to the Sacred Heart of Jesus. The Devotion to the Sacred Heart isn’t a new devotion, but one that many don’t know the story behind. To come to know and love deeper the Sacred Heart of Jesus Christ, “Healing Promises: The Essential Guide to the Sacred Heart” by Anne Costa will share with you the story behind the Holy Image and explain how to devote yourself and family to the Sacred Heart of Jesus. I say ironically, but with God, I know it is all planned, I started reading this book on the feast day of the Sacred Heart. I also have been celebrating “First Fridays” where there is a plenary indulgence if you receive the Blessed Sacrament and pray the devotion prayer to the Sacred Heart of Jesus for 9 months. Knowing of this indulgence is one thing, but really understanding the devotion and blessing we receive for dedicating ourselves to the Sacred Heart really renewed my love and dedication to Our Lord. “Healing Promises” begins with explaining the what the devotion to the Sacred Heart is and how St. Margaret Mary received these visions. Costa then reveals each of the promises that are received through total devotion, including Grace, Peace, Comfort, Refuge, Mercy, Blessings… – there are 12 of them! Many people view “blessed” as those with fancy cars, large houses, and lots of money, but these are not the blessings we receive through this devotion. While we may still be blessed with a comfortable lifestyle, we must stay focused on the blessings which lead to Eternal Life, the entire reason why Jesus came to earth! Finally, the appendices give us the resources we use to enthrone the Sacred Heart and the devotional prayers. These are beautiful prayers, some for help in specific situations such as forgiveness, loss, addiction, and health. We all can use these prayers during the trials and tribulations in our lives. 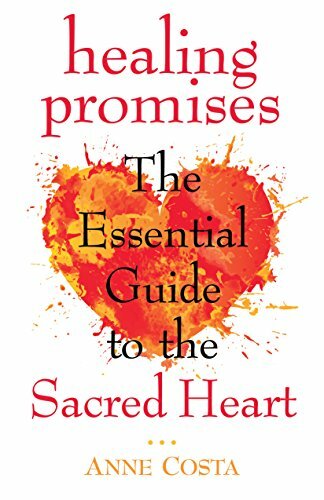 I highly recommend “Healing Promises: The Essential Guide to the Sacred Heart” by Anne Costa. If you are looking for a new devotion or a new way to pray, or even enthroning the Sacred Heart of Jesus for yourself or your family, this book will give you all that you need to properly devote yourself to the Sacred Heart of Jesus. St. Margaret Mary Alacoque, Pray for Us! Our human hearts were made to love and to be love; to give and receive love. Every beat of every heart is made possible through a God who IS love. But did you also know that the very heart of God beats just for you? That is what Jesus said when He spoke to St. Margaret Mary Alocoque, Apostle of the Heart of Jesus, and revealed His enflamed heart to her. The revelation of His heart is what we have come to know as the Sacred Heart of Jesus; one of the most recognizable images and symbols of our Catholic faith—but one of the least understood devotions of our day. We may know the image, but have yet to experience the depths of the “hidden” love story behind it. In Healing Promises, you will learn about the many ways to express devotion to the Sacred Heart as well as the history and relevance of the Sacred Heart for our lives today. You will also hear from saints, popes and ordinary people who have been touched by the Heart of Jesus. Healing Promises is truly a treasure trove of resources and inspiration for anyone who wants to learn more about the Sacred Heart of Jesus. You’ll learn about the history and foundation of the Sacred Heart devotion as we know it today and the 12 promises Jesus revealed to St. Margaret Mary Alocoque in private revelation. You’ll find prayers for the enthronement ceremony, reflections and practical ways you can apply the Sacred Heart devotion to your life. Author Anne Costa even provides a list of resources and recommended reading to help you take your devotion to the Sacred Heart even further. Christ’s fidelity to the promises He offers through the Sacred Heart devotion is perhaps the best kept secret of our faith in these times. Journey to the center of His Heart, where His promises are real and his message will always be: You are not alone. You are loved!